Have you ever watched a television show, heard a lecture, or read a book, only to later find that the information was incorrect? It seems to me that history is often made up of stories told with little fact checking. My name is Mark Douglas Brown. I have researched Al Capone’s federal prison records, newspaper articles, and numerous archives around the country checking the authenticity of Al Capone stories. Because of my research I have written two books about Al Capone: “The Capone Files,” and “Capone: Life Behind Bars at Alcatraz.” Both rely on documents to tell Capone’s story. 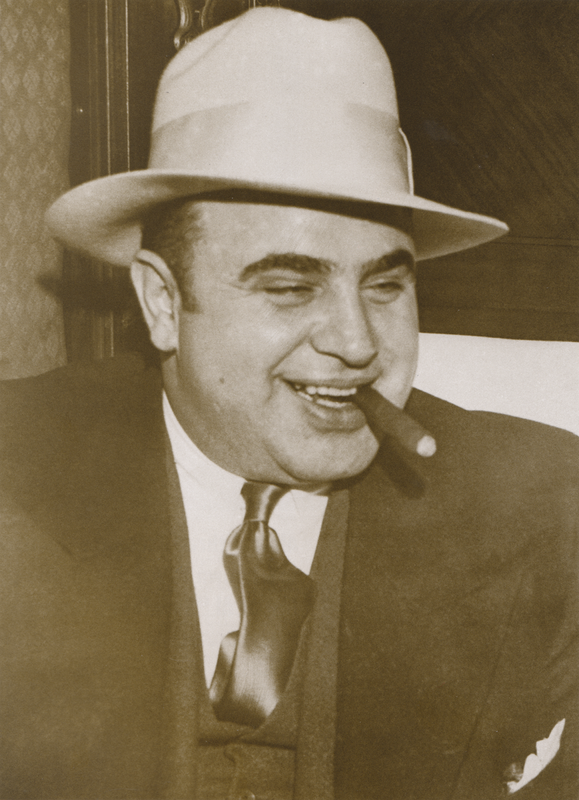 This website uses documentation and research to look at the life and times of Al Capone. Interested in learning more about Al Capone? See my companion book, The Capone Files, or pick up a Bad Guys Press special-edition poster featuring Capone's authentic mug shot and rap sheet from the Alcatraz Warden's Notebook. Also available is a poster featuring Machine Gun Kelly. For another great site, take a look at Mario Gomes's My Al Capone Museum. Alcatraz inmates were allowed one visit a month from their immediate family, or by other approved visitors. Like other families who lived far from Alcatraz, the Capones would often visit the last day of one month and the first day of the next, combining two short visits into one longer stay. When I hear people on TV documentaries talk about Al Capone’s last months in prison and his death almost eight years later, the information they give rarely matches his prison records. Where Was Al Capone’s Alcatraz Cell? Visitors to Alcatraz are often confused about where Al Capone’s cell was located. Why was Al Capone sent to Alcatraz? On May 4, 1932, Al Capone arrived at Atlanta Penitentiary to serve his sentence for income-tax evasion. Stories say that, while there, Capone had control over prison officials, and enjoyed many more privileges than other inmates did. That’s the reason why many say Al Capone was later sent to Alcatraz. What is not often said is that all allegations of special privileges were investigated by the Federal Bureau of Prisons and J. Edgar Hoover’s Bureau of Investigation (later, in 1935, it became the Federal Bureau of Investigation). What happened to Al Capone's health at Alcatraz? According to Al Capone's prison records, Al contracted syphilis in his early twenties. The disease remained dormant until February 5, 1938. The following reports were sent to the then U.S. Attorney General Homer Cummings by James Bennett, Director of the Federal Bureau of Prisons, explaining the incident that caused Capone to be hospitalized. Special thanks to the University of Virginia Library, Albert and Shirley Small Special Collections. In 2014 I received emails asking me if I was aware of an Internet story that claimed FDR rode in Al Capone's armored Cadillac to declare war on Japan. According to the story, it was December 8, 1941. Japan had bombed Pearl Harbor the day before and the Secret Service felt the president needed an armored car to protect him on his ride to Capitol Hill. The Secret Service is said to have had Al Capone's 1928 Cadillac in Washington, DC, at the time. The story Claims the IRS confiscated Capone's Cadillac after he was found guilty of tax evasion in Chicago. "Scarface" Al Capone: How did he get those scars? Is this the man who put the scars on Al Capone's face? This March 28, 1940, (AP) story from the Evening Independent Massillon, a newspaper published in Ohio, seems questionable to me. Although Capone's face was permanently scarred, the article claims that Capone overlooked his own injury. Capone is said to have become so impressed by Frank Galluccio’s "chivalry" in attacking him that he made him a lieutenant in his criminal organization. The last paragraph of the article refers to the story as a gang legend. 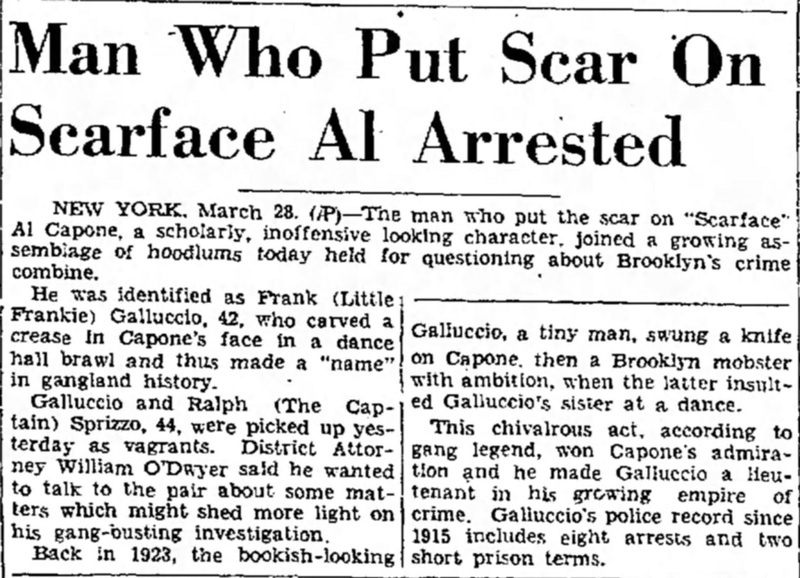 However, nowhere is Galluccio quoted as saying that he put the scars on Capone’s face. Below is Capone's 1932 rap sheet (courtesy NARA, San Francisco) from when he began serving his sentence for income-tax evasion at Atlanta Penitentiary. Copyright Bad Guys Press. Simple theme. Powered by Blogger.